UN Secretary General Kofi Annan has called on the United States to show the same commitment to the fight against HIV/Aids as to the war on terror. Terrorism could kill thousands but "here we have an epidemic that is killing millions", he said in an exclusive interview with the BBC. Mr Annan appealed to the US to devote more money to tackling HIV/Aids. But President Bush's Aids adviser said the US was already by far the biggest contributor to anti-Aids campaigns. Mr Annan who is attending the International Aids Conference in Bangkok, said the US was spending huge amounts to tackle terrorism and weapons of mass destruction but had failed to deliver on its promises to combat the spread of Aids. He expressed disappointment that some of the $15bn earmarked by President George W Bush to tackle HIV/Aids was not yet going to the global fund - the body set up to raise money for Aids programmes. "The global fund is ready to go. If individual governments begin to set up their own initiatives, they start from scratch, it takes longer, the money that they hold will not be spent for a long time," he said. Mr Annan said he had hoped the US could at least contribute $1bn a year through the global fund, with the EU putting in another $1bn. With additional resources raised elsewhere, "the fund could have assured and sustained support through the next five years or so," Mr Annan said. He said he believed Mr Bush was concerned about the impact of Aids, but said it was now time to step forward and commit resources to that fight. "We really do need leadership. America has a natural leadership capacity because of its resources, because of its size," he said. And he appealed to governments around the world to show "international solidarity" by pooling their efforts. But Dr Anthony Fauci, President Bush's senior adviser on Aids, said the US decision to distribute money through its own Aids prevention programmes reflected initial concern on how the global fund would be managed. "At the time the global fund was starting to get rolling, there was a concern on the part of the United States that if they put in this massive amount of money, $15bn, they wanted to have much more of a direct say in how it was spent," Dr Fauci said. As the conference continued on Tuesday, protesters demanding more access to cheaper anti-Aids drugs interrupted several speakers including a French government minister and a representative of a major drugs company, Pfizer. 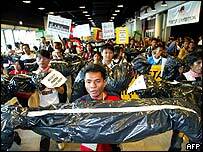 Brandishing mock body bags, they chanted, "Break the patents, treat the people." Activists criticise industrialised nations for failing to contribute enough money and blame pharmaceutical companies for the high cost of antiretroviral (ARV) drugs. But Pfizer chief executive Hank McKinnell said the protection of patents drove innovation, by ensuring companies would earn profits on important inventions. The scale of the Aids crisis has been highlighted in a report by Unicef, which says that between 2001 and 2003 the number of children orphaned by Aids worldwide rose from 11.5 million to 15 million. The worst hit region is sub-Saharan Africa, where nearly four million children have lost one or both parents to Aids since 2000. By 2010, more than 18 million youngsters will have been orphaned. These numbers are so large they have the potential to undermine the stability of countries, Unicef's executive director Carol Bellamy warned. "Unless society really is mobilised to take these children in to try and support them so that they become productive adults, you really are talking about the whole stability of societies being threatened," she said. "The head of the UN has criticised US policy on Aids"
'Bug chasers': Fantasy or fact?